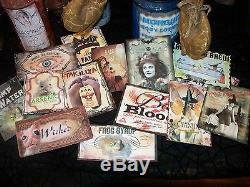 15 Halloween Witch Potion Bottle Labels - Peel-n-Stick Stickers (set THREE) Scary. This set is Made To Order meaning processing time will be a little longer. In this set you will receive 15 Potion Labels Great for bottles, jars, cans. Cards well just about anything you can think of Just let your Witchy imagination take over the possibilities are endless These Labels have been printed on self stick paper then each one has been cut out and MaGiCaLlY spooked up and then sealed for protection by this old WiTcH herself (PlEaSe ChEcK oUt My OtHeR LiStInGs FoR mOrE sEtS oF pOtIoN lAbElS) All labels are shown in the picture. Labels will come to you pre-cut & on self stick paper. Large Variety of Shapes and Sizes. White The Druggist 4.25 in x 2 1/8 in. Bat Fangs 4 in x 3 in. Hair of the Dog 3 3/4 in x 2 1/4 in. Witch cyanide 4 in x 2 1/2. ARSENIC 3 1/2 in x 2 5/8 in. Frog Syrup 4 1/4 in x 2 in. Takillya 4 1/2 in x 3 in. Wicked 4 in x 2 1/4 in. SINFUL SATANS 4 3/4 in x 3 in. 10 Bubbling Brew 4 in x 2 1/2 in. 11 Cyanide 3¼ in x 2 1/2 in. Newts Eyesl 4 in x 3 in. Bat oil 4 in x 3 in. Swamp Water 3 3/4 in x 2 1/2 in. Bat Blood 3 3/4 in x 3 in. Since each set is spooked up by hand after printing the effects may slightly differ from the picture shown. As aLwAyS tHaNkS fOr dRoPpInG bY you will only receive lables all other props not include but you knew that :o. The item "15 Halloween Witch Potion Bottle Labels Peel-n-Stick Stickers (set THREE)Scary" is in sale since Saturday, September 29, 2012. This item is in the category "Collectibles\Holiday & Seasonal\Halloween\Current (1991-Now)\Props". The seller is "kaylas*krackling*kauldron" and is located in Kirkland, Illinois. This item can be shipped to United States.